Amazon.com Price: $318.42 $220.45 (as of 22/04/2019 09:40 PST- Details) & FREE Shipping. 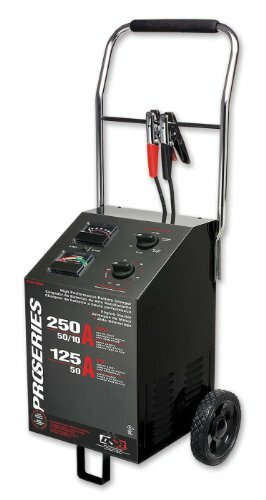 Schumacher’s PSW-2550 Manual ProSeries Wheel Battery Charger/Starter charges 6 and 12 Volt batteries. For 6 Volt batteries, there is a 125 ampere starting charge, and a 50 ampere charge rate. For 12 Volt batteries, there is a 250 ampere starting charge, with 50 and 10 ampere charge rates. Additional features include, 2.25 hour timer, oversized selector switches, clamp holder, rubber grip and an extra long 9 foot AC line cord.